I appreciate whoever scooped up after their dog, but please don’t leave the bag behind. I know how embarrassing it is to walk around the neighborhood and to carry the poop bag. I’ve done it many times. At least, the neighbors appreciate your effort. 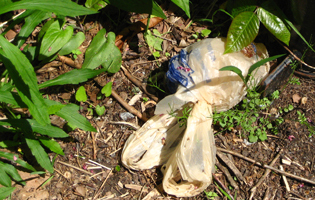 Since the bag is on the trail, it is litter.